Members of PM are joining workers, urban poor, farmers and other sectoral groups who will assemble at Meralco along Ortigas Ave. and then march to the People Power Monument for a multisectoral program. Meanwhile the PM chapter in Cebu is participating in a rally at downtown Gaisano Metro this afternoon. PM also expressed apprehension at the suppression of political dissent with the arrest of Sen. Leila de Lima. “Workers defend civil liberties because political freedom is a necessity in fighting for and winning labor demands,” Fortaleza explained. PM-Kabataan echoed this call. “As working class millennials—community youth and young workers—we are witness to, nay victims of, the disaster of three decades of EDSA democracy. 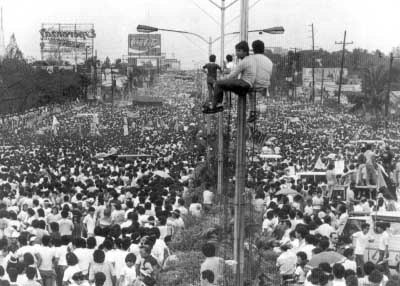 To those living in the purgatory of the EDSA democracy, the hell of martial law is little comfort. No surprise then that purveyors of fake news, creative imagination and alternative facts are having a field day,” Bocacao explained.